Full Metal Jackets I and II are two different spatial configurations of the same generative text and sound sculpture/installation. In both cases, the sounds of empty gun shell casings are output to an array of 32 small full-frequency neo-dymium speaker drivers, in a variety of patterns which are determined algorithmically, on an ongoing basis. 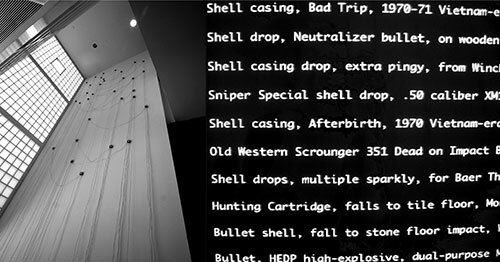 At the same time, the titles of the sound files — which describe the gun shell casings in elaborate detail, are output to a nearby monitor. Full Metal Jackets I was first shown at the Banff Centre for the Arts, in Banff, Canada, as part of the show ‘Aural Cultures’. 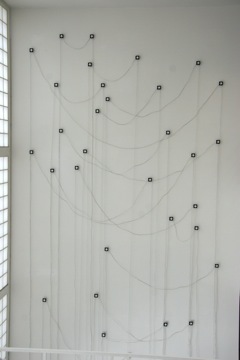 In this version of the piece, the speaker drivers are arranged in a 16:9 grid, similar in shape and size to a film screen. Full Metal Jackets II was commissioned by the Yerba Buena Center for the Arts in San Francisco, CA, for ‘Bay Area Now 5′.In this version of the piece, the speaker drivers are arranged much more loosely.